Rev. Dr. Arthur Henry Ewing (1864-1912) was a prominent Presbyterian missionary and academician. He graduated from Washington & Jefferson College in 1887. In his missionary duties, he served as a principal of a Boy's Boarding School in India and served as Principal of Allahabad Christian College from 1901-1912, which was later renamed Ewing Christian College in his honor. He was the brother of James Caruthers Rhea Ewing, who was also a Presbyterian missionary in India. 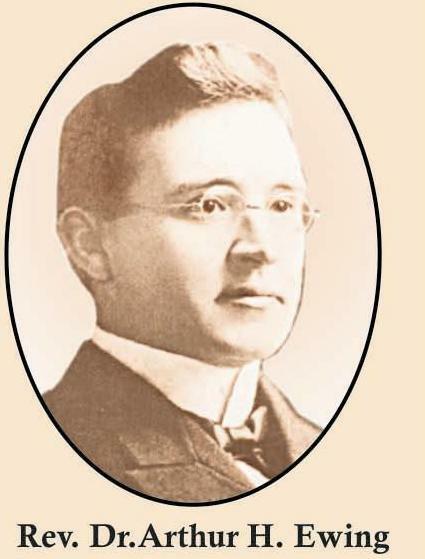 Ewing Christian College (ECC) was established in 1902 and Dr. Arthur H. Ewing was its first principal. ECC is one of the oldest colleges established in India. It was an initiative of the East India Company. At that time it was named as Vernacular School. In the mean time, its governance got shifted to the Presbyterian Church. In 1910, it was renamed as Allahabad Christian College. The college campus is located on the northern bank of Jamuna river near Sangam on the southern part of Allahabad city. Spread on a sprawling green campus of 42 acres, on the bank of river Yamuna, the College opened its Agriculture Economics Extension Department on the other side of the river which soon developed into Allahabad Agriculture Institute (Sam Higginbottom Institute of Agriculture Technology and Science). The College took giant strides in the field of higher education, with Dr. Dudgeon opening first laboratory course in Botany, laying a very strong base for research in the College, training students like Panchanan Maheswari, who excelled as a Botanist par excellence.